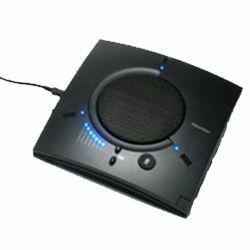 A speaker phone for individual or small group use. The Chat 150 connects to telephones, PCs, and video conferencing systems for rich, full-duplex audio communications. It provides speaker phone capability that is far superior to the built-in options on these devices. A perfect addition to the office or conference room for greatly enhanced collaboration.